I watched a lot of Say Yes to the Dress with my roommates in college--a lot--and so many of those Say Yes girls cried and laughed and argued and, in the end, came home with a white strapless dress. I didn't want polyester. No thank you. Silk and cotton, please. I wanted pink, and not wedding-dress-blush-pink, that taupe-y mauve-y pink seen in abundance here, but pink! Pale pink, but pink pink! And I wanted sleeves! I wanted lace sleeves that didn't have seams all over them, seen in abundance here (especially at the armscye, like, wtf armscye seams). Negotiable: as many bows as possible. 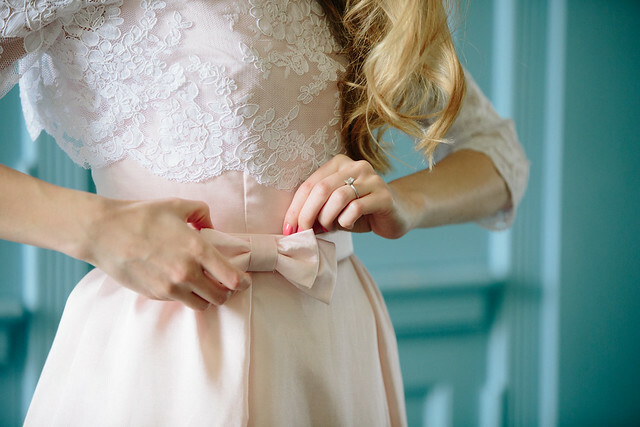 In case it looks like this post is just a great way to show off my impeccable wedding style (it totally is) here are some sewing details! me thinking about how I didn't put a hook and eye and should have put the bows in different positions, maybe? I knew I wanted to make my dress, and I poked around on etsy, mostly for inspiration--I was fully intending on hacking together a few patterns to create my dream dress--but Simplicity 5343 was basically everything I had been looking for, so I said "yes!" to my dress (pattern)! I didn't even really look at any other dresses or patterns. It was just so perfect. I made about 5 bodice muslins and then called in the professional help, booking a block of time with Brooks Ann Camper. I'm super lucky to live about 30 minutes from her studio, and she helped me to make some construction decisions and perfect the fit on the bodice of my dress. - took in the sides about 1/4"
Bonus: now I have a perfectly-fitting basic bodice to use for every sundress ever. I picked up a thin cotton in a matching pale pink from Mulberry Silks and Fine Fabrics (my local nice fabric store) and underlined the silk/cotton fashion fabric by hand. Then I used the clean-finish bodice lining technique to get a nice finish on the interior and exterior of the bodice. I hand stitched in boning on the side seams. Bodice: done. For the skirt, I underlined with silk organza to give it a lot of body. I didn't line it, since I wasn't sure how hot it would be, and I wanted to stay comfortable. Those pleats are crazy, by the way. You can't tell on the finished dress, but they were very complicated. I used horsehair braid on the hem to give the skirt some volume. I loved the shape it turned out! For the jacket construction, see this post, but pretend everything is white, not black. The only changes between the two were that I shortened the white one about 1 1/2" and that I used other bits of the same lace as the edging up the back and around the white neckline--I couldn't find a white lace trim to match! I like the effect though. I actually think the black one is slightly better--the lace is a little different and it was easier to work with, in my opinion. I hated making the white version just as much as the first one, for what it's worth. My mom made my veil--it's just two GIANT rectangles of tulle gathered onto a comb. I changed out of my veil for the reception, instead putting a giant bow on top of my head. My mom also made the belt. We used belting, something neither of us had done before. My family! See my beautiful mom's beautiful dress? In addition to helping me with my dress, she also made her own! It's Simplicity 2444 in white and navy silk. So talented, isn't she? Any other seamstresses make their own wedding dresses? I've looked at a lot of handmade wedding dresses, but I'm sure I've missed some! Would you make yours?? ps: i'm not the only one to use simplicity 5343 to make my wedding dress! 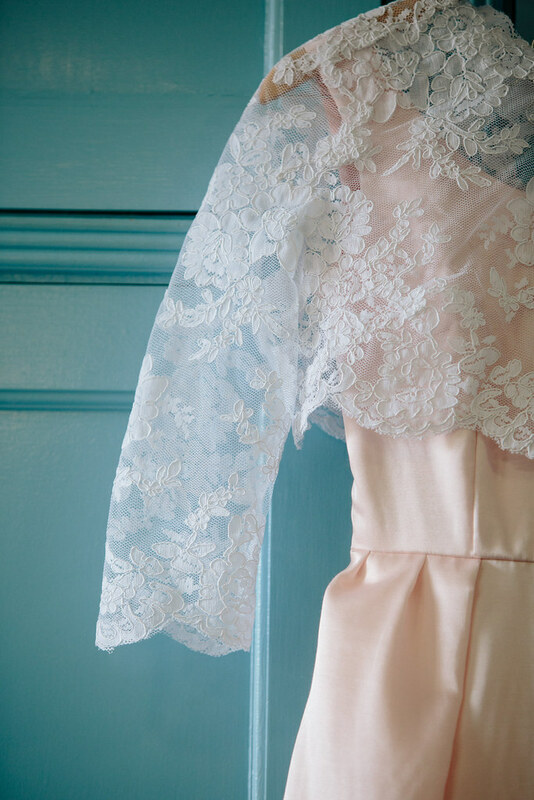 The Blue Seamstress used the short version for her wedding dress (with a pink sash), and there are several others that have used bits and pieces of it! Oh WOW! Your dress is so stunning! I have so much respect for people who make their own wedding dresses, it's something I'm aspiring to...one day :P I love that you didn't just go for plain white, the pink is so pretty. Madam, you are no "sewer"- but a seamstress! 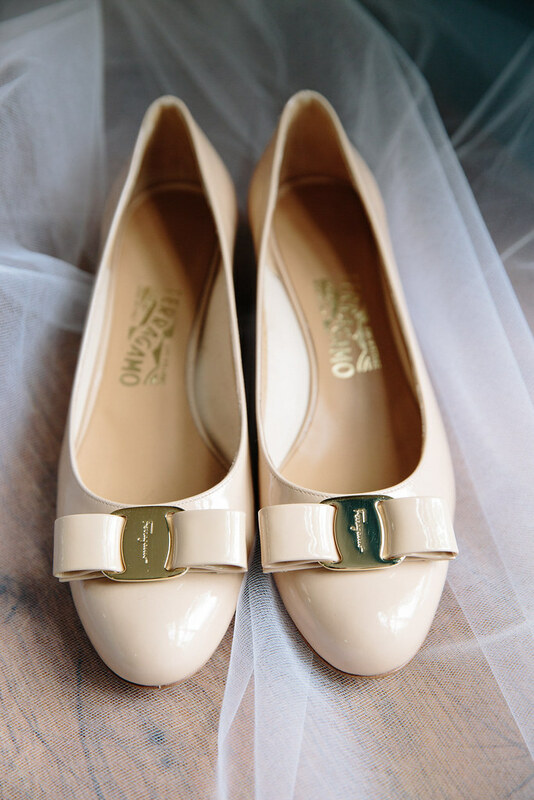 :) a true one at that (I would loth to refer to anyone as a 'sewer'..... ) just adore the Ferragamo's, we wore those as our school shoes eons ago. Can you imagine? I applaud you on the "no sleeveless wedding gown" idea. That is a trend I can't wait for to die out. It just isn't very bridal, is it? Who am I to complain. ANY girl could only wish to do as well as you've done in this gown, it truly is just astonishing. Good job. I think it's the perfect pink too! I actually ordered it from a local store, but they hadn't realized it was being discontinued! I panicked for a bit and then managed to buy the last yards of it from B&Js! Thank you for commenting! Thank you! I really didn't enjoy hand sewing it--but in fact, the tedium of completing that project has made me much more willing to undertake smaller hand sewing tasks, like zippers and such, so it has really made my sewing better! Thanks Allie:) You looked beautiful on your wedding day!!! omg! you two are the cutest! i love love love your dress! the pink and the lace top is awesome together and i like how the lace top is slightly wider at the hem then your waist. just like in the pattern illustration! you look soo pretty and 60s! i love it and i totally would have gasped out loud at the wedding. heck i did that reading this post! i can totally see you in a little white lace mini! Thank you! They were the trickiest part of the dress (besides the jacket, of course), and the reason I picked the pattern I did. I love your blog! 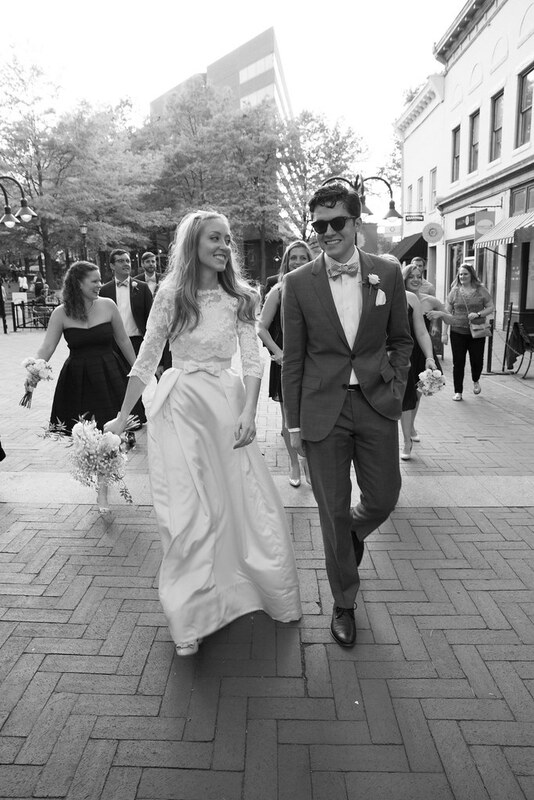 Congratulations on a beautiful dress and a perfectly elegant vintage look! And I love the coordinating Ferragamos and matching pink nail polish. I hope the entire day was magical. Your dress is just wonderful, you did such a great job! I love that you chose pink instead of white (those strapless wedding dresses aren't my thing either), and the Ferragamo's finish it off perfectly. thanks! I know you are somewhat of a collector so I'm glad you approve :) I really loved wearing pink and I felt much more myself than I would have had I worn a poofy white dress. Congrats, I've been waiting to see your dress and it did not disappoint. Great job and you looked truly lovely! I've always loved those little over-blouses with vintage dresses. By the way, were you and your mother wearing the same shoes in different colors? Thank you! We were not wearing the same shoes but they do look a lot alike! I believe hers were Brooks Brothers? your husband is very attractive. Thank you! I've just followed your blog and I'm looking forward to seeing your construction post! Beautiful! 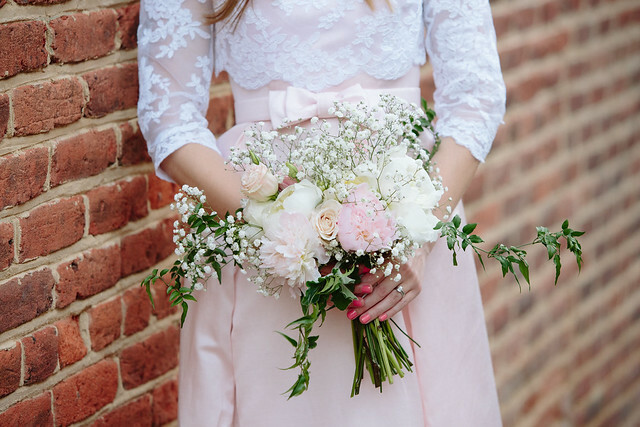 I wanted a pink silk dress with sleeves but had trouble fining one in my budget! Wedding related question--I was planning on registering for a sewing machine. Do you have a recommendation for a beginner friendly one? Nice to *find* you here! I would also say to buy it at JoAnn Fabric during one of their big sales, too! I don't know how that would work as a registry gift, but you can always find deep discounts there. very pretty! I love the color you chose too! Thank you! I looked for the perfect pink forevvvvver! Or pick an easy pattern!! ;) Thank you! Everything about your dress is PERFECT! I love the color, your shoes are amazing, your hair and veil are magnificent! I love the last photo of you and your husband. It says pretty much everything there is to say about marriage. Thank you! 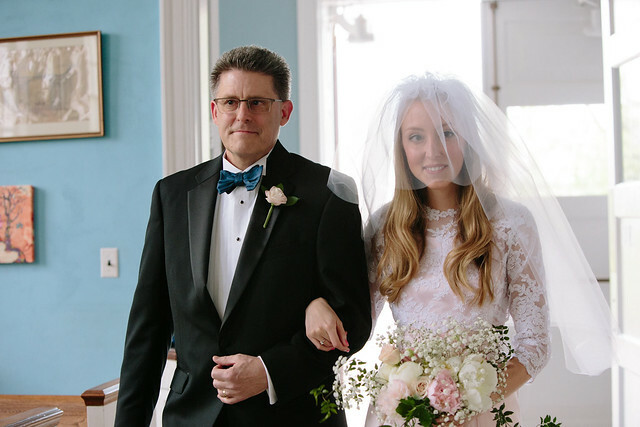 I really didn't want to do a super-DIY wedding but I think I made a good choice to do my own hair & makeup and make my dress & veil--I felt like myself. And I'm glad you like that photo! It's really one of my favorites, I'm definitely going to print & frame it! You look completely perfect in your wedding dress! 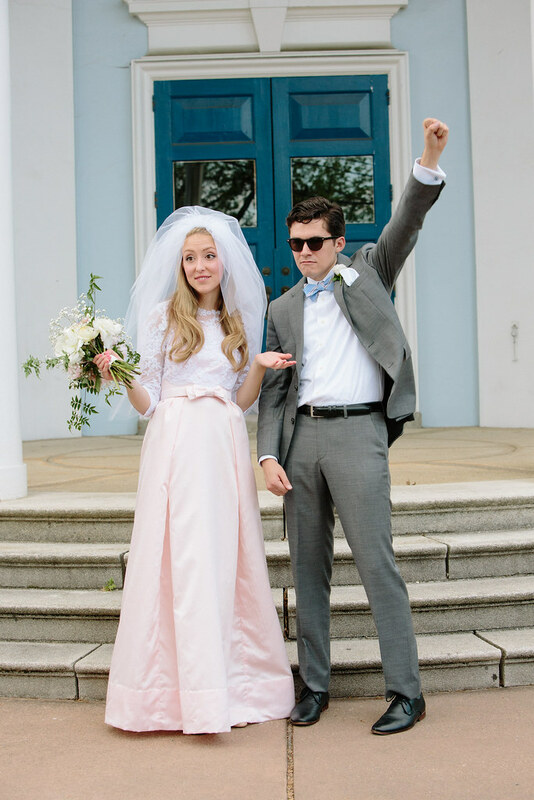 You definitely had great wedding style. It's gorgeous and perfect for you! Love your comment about Say Yes to the Dress. So very true. no imagination. congrats by the way! AHHHHHHH YOUR DRESS!!!!!!!!!! It's PERFECT! Awesome job, lady! I got married before I could sew and ended up in a just-barely-off-white strapless dress that I really hated. I had a lot of pressure from my mom to do the traditional thing and I just couldn't quite assert myself the way I wanted to. So I'm always happy to see brides that really look like themselves on their wedding day. You look like you, but just extra pretty and extra happy! Congratulations!!!!! Wow. Beautiful work. The blush shoes kill me. Much of my husband's extended family lives in and around Durham, and the last time we visited I went to Mulberry Silks...such a beautiful store with amazing fabric. I so wish I lived closer. Splendid! Thank you for sharing your special day and your wonderful skills (Mom's too). 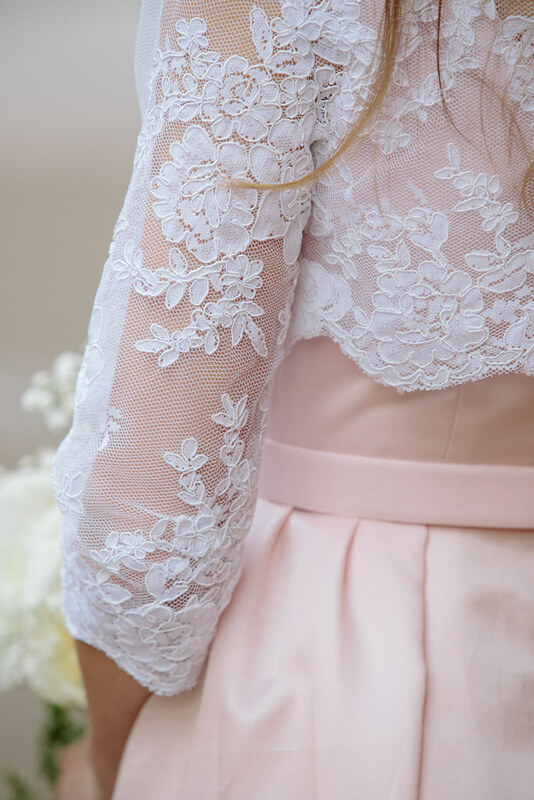 Stunning colours, love the blush and lace combination. Well done! I made mine and it was pretty stressful but I'm glad I did it! Your wedding dress is amazing !!!! Congratulations !!!!! WOW! Your dress is so, so beautiful, you look wonderful in it and it looks like such a happy wedding day! Extremely lovely. I got married in June and made my dress, mine is a fifties affair with lots of lace. Like you I didn't want strapless, didn't want polyester, and I wanted something that reflected my personality. Well done, lady, your dress is ace. I found your post through Closetcase Files. Your dress is amazingly beautiful. I also love that your husband wore a suit. It's all heartwarmingly real, and I wish you years of happiness. You're certainly off to a good start! Ohmygosh, I love the pink!!! 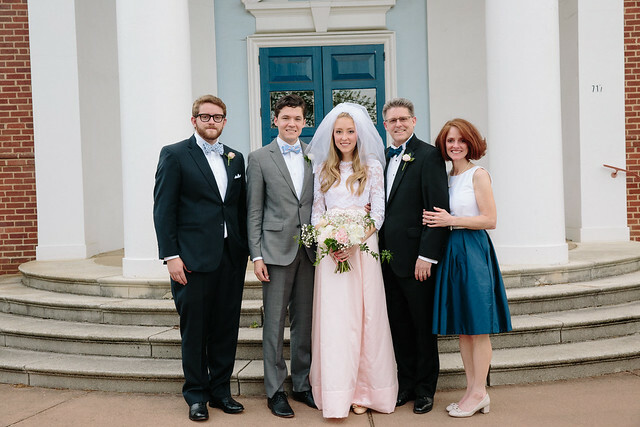 I never would have thought to wear pink on my wedding day but you really pulled it off. This dress is gorgeous, you did an amazing job. I love your sewing skills! I'm also in the process of making this dress - but the shorter one! Just wondering if you tacked the pleated folds on the skirt down? I did not on the final dress, no. It might be helpful to thread baste them shut while sewing though! Im also in tbe process of making this dress (the shorter one) and was wondering if you tacked the folds on the skirt down?